Mike Tramp’s solo album, called Cobblestone Street just released in the last month, but White Lion’s live legend is already on tour, to sing out all to the world, what he feels inside. „On Cobblestone street I go back to my roots and i also deal with my very difficult personal life. It is almost like you come inside my heart and soul and witness the pain..”- he said in an interview earlier. Listening his new album it really came out by the tunes of the disc. All of his songs are an unique lifestyle, owning a personal feeling, or an everyday heart motion of a human being. Mike sings specially for everybody’s soul, telling his life and secrets, just like a friend from the neighborhood. The album includes ten fine acustic-rocking songs, but to be honest Cobblestone Street have something more for you. It is a disc, containing and holding somehow all the emotions and feelings what we have, with all the questions what we ask, and unsureness, what a human being could usually feel in his life. So songs are about our whole existence, topics are giving the feeling to drink a bottle of wine, and just talk. Tunes are also telling stories, maybe a bit more, than lyrics does. As people thinking sometimes back on the life, asking the never answered question, if done and happened everything well.. Ten tracks make a total picture, but my favorit is the „Find It In Your Heart” song, totally got the feeling of it. 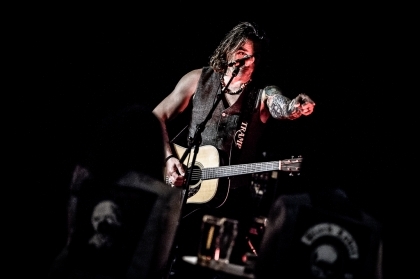 Mike also highlighted one, „Cobblestone Street”, as his favorit, commented so: „Cobblestone street is an extra special song that has brought this album back home to where Mike Tramp's music and soul comes from.” Happier and more sad moments are swirling around us, totally mixing our thoughts listening the disc. And naturally then, when you are on your way, just cant forget these tunes.. and not only the melody stucks in your head.. Somehow a personal feeling, a strange memory, maybe a part of this undirect message stays with you..